Release Date: February 3rd, 2006 by Focus Features. The Cast: Sanaa Lathan, Simon Baker, Golden Brooks, Mike Epps, Donald Faison, Taraji P. Henson, Blair Underwood, Alfre Woodard. BASIC PREMISE: Kenya (Lathan) gradually develops an interracial relationship with her white gardener, Brian (Baker). 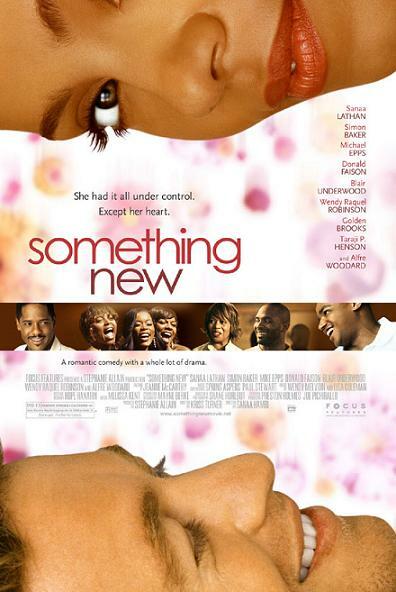 ENTERTAINMENT VALUE: Despite a derivative, predictable plot, Something New feels surprisingly refreshing thanks to Sanaa Lathan’s charming performance, strong romantic chemistry, and beautiful cinematography. When Kenya first meets Brian on a blind date, Brian seems like the last person she would go out with given how seldom they talk to one another. Later, she runs into him at a party and she hires him to work on her backyard garden. Throughout most of the plot, she plays hard-to-get but you know that she really likes him. Her mother (Woodard) would never approve of interracial dating. Brian tries to win Kenya over by spending time after work with her. He even brings his cute golden retriever along with him. In one scene, he takes her hiking just when it’s about to rain. It would have been interesting and original if Brian was not a stereotypical muscular hunk with a good heart. The script has enough humor and warmth to engage you with the sunny characters. The second act includes their temporary breakup while Kenya starts dating a successful black man (Underwood) to impress her mother, but, of course, there’s no romantic chemistry between them. Does it matter if she will be able to get Brian back? Yes, because you want them to end up together. What makes their love so believable is that they actually have romantic chemistry together, not just because they’re both very attractive. The entire film is beautifully-shot with vibrant colors and, on top of that, a great soundtrack. SPIRITUAL VALUE: Sometimes, trying something new can be a great thing for you, especially if you life feels bland. With Brian in her life, Kenya to blossoms like a flower when she follows her heart and does what makes her truly happy. The bright, sunny ending will lift your spirits, warm your heart, and put a smile on your face. INSULT TO YOUR INTELLIGENCE: Slightly predictable and derivative. IN A NUTSHELL: Delightful! Funny, sweet and heartwarming! Sanaa Lathan shines! One of the most romantic and charming date movies! A perfect Valentine's Day treat!